Wendy Coburn (AOCA, 1986) was a Toronto-based artist whose studio practice included photography, sculpture, installation and video. Coburn’s work engaged a range of concerns such as popular culture, mental health, gender, whiteness, nationhood and the role of images in mediating cultural difference. 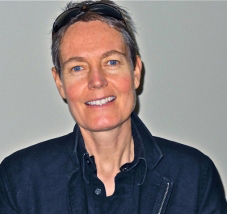 An associate professor at OCAD University, Wendy Coburn served for several years as an Associate and Assistant Dean in the Faculty of Art and most recently led curriculum development for a new Art & Social Change program. Coburn taught in the Sculpture/Installation program and also taught a cross-disciplinary course fostering research and peer support for studio production in the areas of sexuality, gender and LGBTQ issues. Coburn’s work has been exhibited and screened in exhibitions and festivals including Landmarks (Thames Art Gallery), the Living Effect (Ottawa Art Gallery), Photophobia (Art Gallery of Hamilton), MIX (New York Gay & Lesbian Experimental Film/Video Festival), Transmediale International Media Art Festival (Berlin, Germany), Kassel Documentary Film & Video Festival, and the Dublin Lesbian & Gay Film and Video Festival. Wendy will be greatly missed by the OCAD University community. OCAD U faculty and staff may make their pledge/gift using the online giving form below or via payroll deduction form.